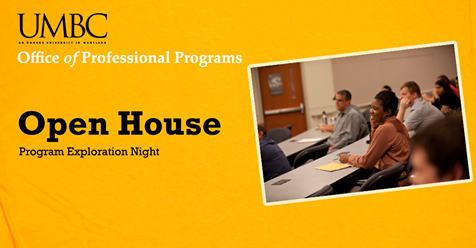 The Spring Open House for UMBC’s graduate Professional Programs, including cybersecurity and data science, takes place 9:30-11:30am on Saturday, April 6th on the first floor of PAHB. Students interested in exploring these graduate programs (degrees and/or certificates) are encouraged to register and attend. Current CSEE majors interested in a BS/MPS option for cybersecurity or data science are especially welcome. Explore how UMBC’s professional programs can help you meet your goals, build your professional network, and equip you with the technical, leadership, and management skills that employers are looking for. You’ll have the opportunity meet with faculty and staff, gain information on financial aid and career opportunities, and find out why UMBC is the perfect place to expand your education. UMBC offers a wide variety of part-time and full-time professional programs in an array of relevant fields, including graduate programs in Cybersecurity, Data Science, Engineering Management, Entrepreneurship, Innovation and Leadership, Instructional Systems Development, Health Information Technology, Integrated Product Development & Manufacturing, Project Management, Systems Engineering, and Technical Management. The programs are designed to meet the needs of working professionals and our flexible course offerings allow you to complete your degree on your own time.